Most everyone seems to be soliciting God's favour. It is of course a normal thing to do for those among us who do believe in God. Problem is, my opponent is asking for favours from Him at about the same time that I am. What's more, even in confrontational situations such as war, or a murder trial, both parties seek help from the same entity. Does God's help then go to the one who eventually wins? And does that mean God isn't on the side of the loser? "Assessing the will of God," the same source informs us, is described in Psalms 86:6-7: "Give ear, O LORD, unto my prayer; and attend to the voice of my supplications. In the day of my trouble I will call upon you: for you will answer me." The other characteristics of prayer, from praising God to asking God to curse the enemy, are clear enough not to be belaboured. The questions remain, however -- questions whose answers seem even farther away when one ponders the multitude of religions. When President George W. Bush, a well-known born-again Christian, kneels down at bedtime to ask for favours concerning the capture of Osama bin Laden, and the latter, a well-known Islamic Fundamentalist, does likewise to ask for something against the former, what happens? And is that what some label "the clash of civilisations/religions"? One of the things that get me is how most who think God is on their side don't listen to Her. By right, prayer should be a two-way street. You ask, you praise, you acknowledge, BUT you also listen, intently. Our friends, however, know what their God requires of them, know who their God likes, dislikes, will help, will dump, and so on. So in prayer they're really just mumbling meaningless and memorised sayings of the sort, "Shower them with your love." But in all honesty they aren't listening. If there's a God out there or up there, He is probably not on the side of rich folks who sit on poor folks. He's probably unhappy at folks who kill others in his name. He's probably wagging his finger at those who go against the grain of goodness that is inherent in human beings. What grain of goodness? I don't know and I can't be sure of it's existence except where it relates to my own consciousness. Wagging what finger? Again that's what I think God would do, if God existed. But I'm careful not to impose that on you. My own prayer is that we should all strive not to impose our consciousness on others, because I believe that if we succeed, we will have made a giant step toward living together peacefully. There are so many religions and beliefs that if all of us strive instead to impose ourselves on others, then as a race it is a sure thing tha we will never, ever stop fighting amongst ourselves. Was Jesus Christ born on 25 December 0000? Of course he wasn't. My grandmother, who was born in the early part of the past century, couldn't even tell you the year of her birth. She says she was born at the time of Halley's Comet. "A little before or a little afterwards, grandma?" She has no idea. How could somebody affirm that Jesus Christ was born on a specific day, in a specific month? History also tells us that we don't know when Jesus was born. The date of 25 December as Jesus's birthday can be traced back to the 4th century. At the outset it was but an expression of Romano-European festivities that celebrated harvesting and the end of the winter solstice. That would have been a few days after 21 December. Scandinavians celebrated Yule from 21 December, the day of the winter solstice, to the end of January. The solstice of course heralded the return of sunshine and the end of the bitterly cold darkness: a reason to have a ball. So the men of the village, or of the fjord, brought large logs home and set them on fire, and the party was on for as long as the fire was on. Sometimes it lasted 12 days, we're told. We in Lesotho and other African countries nicked the whole thing from our colonisers. I'll never forget the image in Maseru when I was young, of a Father Christmas sweating profusely beneath his Santa Claus suit and beard. The problem is of course the fact that in Lesotho summer is from October to January, and summer temperatures are often in the thirties. Poor guy. And the gifts? The practice dates back to Roman festivals of Saturnalia and Kalends. The first giver then must have given a very simple gift, like a pebble, or hyena-skin sandals, or something of the sort. But the present became more and more sophisticated until the request by today's kids of Play Station material that is hardlt affordable for the average mortal. The early church considered this gift-giving un-holy, but people compared it with gift-giving by the Three Wise Men, and the church had to accept it. I wish you all a merry Christmas and a prosperous 2006. 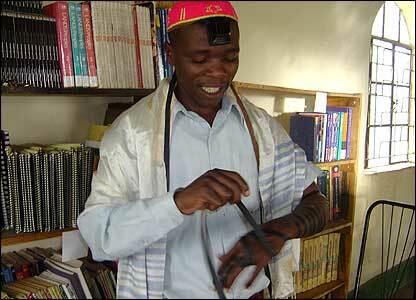 This is very interesting - I had no idea that Uganda is home to a small ethnic Jewish community. They live in the eastern Ugandan town of Mbale and are known as the Abayudaya, which is the Luganda word for Jews.The community was founded by a warrior called Kakungulu, who was used by the British to help conquer Uganda. Kakungulu eventually fell out with the colonialists, settled down in Mbale and converted to Judaism in 1919, without ever having met a Jew. By the time he died, about ten years later he had around 2,000 followers.Through the years the community dwindled, but over recent years has experienced a revival, having grown from around 500 members in 2001 to more than 750 members today. The community has built Jewish schools which are currently also attended by Muslim and Christian scholars.